India’s famed Aravalli ranges have something different to offer at each step. The same is true for the bucolic, rumpled terrain known as Dhosi hill, which is marked by forts, caves, temples and three seasonal waterfalls. It is also surrounded by a forest and, best of all, is still one of the few untouched tourist destinations in the country. 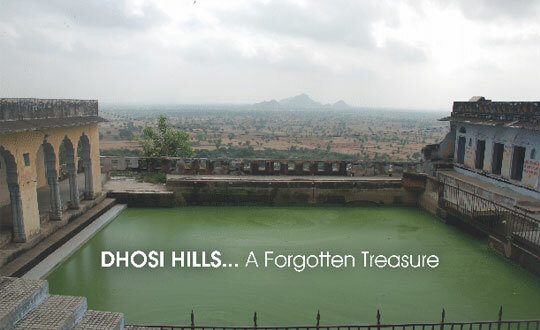 Dhosi hill or Pahadi Dhusran is an extinct volcano located on the borders of Rajasthan and Haryana. It is considered to be an undiscovered treasure providing some extremely great and helpful links to the vedic culture. The hill is widely mentioned in vedic and ancient Indian scriptures including the Mahabharata and the Puranas. Solidified lava is still visible on one side of the hill. According to the Mahabharata, the volcano here, erupted during the beginning of the Treta yug and the hill is believed to have appeared during the confluence of the Dwapar and Treta yug. It has been an important Ayurvedic centre due to its fertile and virgin lands. It is considered to be the place where ‘Chyawanpransh – a paste of 46 herbs – was first created for Rishi Chyavana by two brothers who were known as the royal vaids. They also developed the process of Kayakalp which helped Rishi Chyavana regain his youthful glow. The water in the pool situated at the top of the hill is considered sacred and has healing properties. Scientifically, the water flows into the pool from three sides of the hill and brings dissolved copper and essence of various herbs. To get to the hill, one has to climb 457 stairs that pass through the village of Thana. Atop the hill are remnants of a rock and limestone fort that was built nearly 500 years ago by Samrat Hem Chandra Vikramaditya to protect the ashrams here from invaders. Once inside the fort walls, one reaches the ashram of Rishi Chyavana, son of Rishi Bhrigu and the founder of the Bhargava community. The ashram consists of Shekhawati paintings and also has a Shiva temple. The main temple on the hill not only has idols of Sage Chyavana, Sukanya, Krishna and Radhas but also an asht idol of Lord Vishnu that lies on Shesh Shayaa posture. Way to reach there: By road from Delhi, Haryana or Rajasthan. This is really sad to know that such places lack government’s attention. Haryana has several such places which add a great historic and cultural significance to the state’s heritage. There are two volcanoes in Haryana and this is one of them. There are forts in Haryana which are just dying slow death due to ignorance.